In this week’s episode of Building Local Power we interview Debbie Dooley, President of Conservatives for Energy Freedom and co-founder of the Green Tea Coalition in the southern United States. Dooley’s organizations promote “consumer choice in the energy field” to “provide competition” and stop monopolies from limiting their customer’s options in renewable energy. The Green Tea Coalition features a collaboration between members of the Tea Party Movement and progressives in the Green Party and the Democratic Party in Georgia and other southern states. This conversation tracks closely with a previous Building Local Power episode where our experts discussed hyper-partisanship in our political system. That episode, Breaking Through Partisanship: Left-Right-Local, discussed how local issues and local politics cuts across partisan barriers and brings coalitions of concerned residents together. Christopher Mitchell: Hey John, did you ever see that movie Lincoln? Christopher Mitchell: I didn’t either, there was not enough explosions. It’s on my list but things that blow up or have a lot of jokes get to the top of my list faster. I understand that there’s a discussion there about the difference between a compass and a map, in that the compass shows you what direction you want to go in but a map will actually give you a better sense of how to get to your destination, it shows you where the swamps are and things like that. I feel like your work in energy, this is related to that because you’re trying to get to a spot and you’re looking for the best way to get there. It’s not just marching in one direction and shouting at everyone about climate change. How would you describe what you do? John Farrell: I think what we are doing is trying to open up as many possible avenues for local solutions to the energy economy. We’re looking at that from many different perspectives, whether that’s simple policies to make it easier for folks to afford putting up solar on their own roof, to more complicated fights like trying to break up utility monopolies that use their political power at the state and the federal level to make it more difficult. Christopher Mitchell: It sounds to me like you’re having a lot more success in drawing in a wider political base. You can work with people across the political spectrum for your ends, whereas I think people that are only talking about climate change, they’re not going to be able to get there. John Farrell: Yeah. I think it is the danger of the compass method as you put it and focusing too much on what is the real problem that we’re facing but not necessarily recognizing that there are many roads to get there, and that sometimes the more effective roads in the long run are the ones that attract people where they are, get them a sense of self-interest and buy in into the solution that is often at the local level and that build that larger political constituency so the next time that we have a big national conversation about it, they’re ready to buy in in a language that you have. Christopher Mitchell: Great, let’s talk about this with someone who’s been doing it for quite some time. John Farrell: Sounds like a plan. Christopher Mitchell: We’re now going to bring on Debbie Dooley, the president of Conservatives for energy freedom and the Green Tea Coalition. Welcome to the show. Debbie Dooley: Thank you guys for having me on the show and allowing me the opportunity to get my message out. Christopher Mitchell: Absolutely, we’re excited to learn more about that message. As we get into it perhaps the first question would be, what exactly is the Green Tea Coalition? Debbie Dooley: The Green Tea Coalition was founded in 2013. It was a mechanism that brought both conservative and progressive activists together to support Georgia Power adding more solar to their energy mix. It was made of Tea Party activists and Sierra Club activists. We were very successful in that endeavor. John Farrell: You sort of alluded to this already Debbie, and by the way this is John. Hello, it’s great to talk to you. John Farrell: What motivated you to start the Green Tea Coalition? You mentioned that it was about getting Georgia Power to do more with solar, but also to start the organization Conservatives for Energy Freedom. I’m also interested in how you see that mission aligning with the work that we do at ILSR that we’re calling building local power. Debbie Dooley: I was motivated to educate conservatives and other people about solar and renewable energy. I started Conservatives for Energy Freedom as a mechanism to, the audience was specifically conservatives and republicans, to give them the correct information about clean energy, about solar because they have been given so much false information over the years from groups that were actually funded by monopolies in fossil fuel that did not like the competition from solar and other clean energy. My mission aligns with building local power because I think we can be very effective on the local level, local control, energy freedom. There’s nothing more local than a private property owner that [inaudible 00:04:41] has the right to control the energy he produces on his private property. The power belongs to the people. Christopher Mitchell: You mentioned that one of the goals that you had was correcting misinformation that folks had received about clean energy, do you feel like conservatives need a different message than liberals about clean energy? Debbie Dooley: I absolutely do. My dad is a retired baptist minister. Growing up a preacher’s kid, he always used to tell me, “You’ve got to get them in the church in order to hear your message.” The big mistake progressives make is assuming incorrectly that if someone doesn’t believe in climate change then they oppose clean energy. It is a misconception to believe that. In Georgia, we just passed a third party PPA bill, which will allow third party leasing and sales of solar panels. It passed the Georgia legislature with 100% support from legislators of both parties. It was championed by Republican legislators. 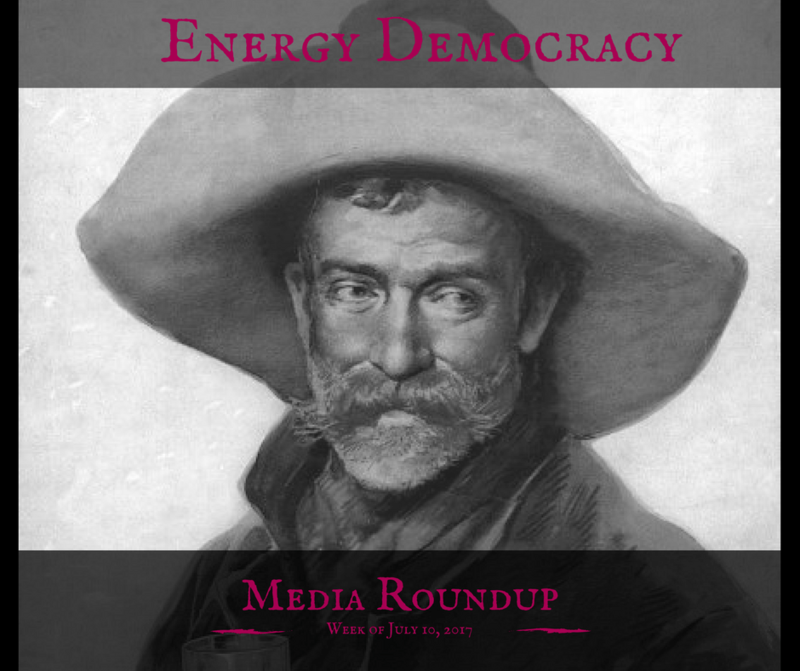 It was with the message of energy choice, free market competition. I absolutely believe that that is the winning message. If you talk to most Republicans about clean energy and you open up, “We need to go with clean energy because of climate change,” they’re not going to pay a bit of attention to anything else you say. But if you talk about energy choice, private property rights, freedom, innovation, national security and being good stewards of the environment God gave us, all of a sudden you will have a receptive audience. I live in Atlanta, there’s different roads that will take you to your final destination of Atlanta. The roads you take is dependent upon where you’re coming from. As long as we work together, someone’s willing to work together to advance clean energy and solar and other renewables, I don’t care why they’re advancing it, wanting to work to advance it. I just care in the end result. Christopher Mitchell: Debbie, I get the impression that when you make this case, that it’s receptive obvious, it’s received well from folks. You’ve been doing it for quite some time. I’m curious where it stacks up from a conservative person, how interested am I in this relative to other things that I might be really interested in, such as lowering taxes or healthcare issues? Is this something that when you talk to people it rises toward the top of their list of interests? Debbie Dooley: It is not at the top of their list of interests. I depends on the timing of talking to them. For example, I was involved in opposing a rate case in the Panhandle of Florida, in the Pensacola area, Gulf Power wanted to bring in a coal plant that was actually losing money that was in Georgia into their [inaudible 00:08:22]. They also wanted to add a $48 per month fixed charged on everyone’s power bill. I called it a solar tax. Because this was going on, people were receptive, Panhandle of Florida is a big Republican area. People were interested at that time because of this rate case going on. At that point, they were interested in it in Georgia. Georgia Power has a big fiasco with plant Votgle and with Westinghouse going bankrupt. People here are very much interesting in advancing solar. Every conservative that I know believes in energy choice. They don’t like these giant monopolies depriving them of the decision of what to do on their private property. They want to be energy independent. If you have a list of 10, it may not rank one, two, three, but it will certainly rank probably five or six on that list of the top 10 with the right messaging. Christopher Mitchell: What do you see … I suspect the answer to this might already be, “It depends,” but do you see a particular opportunity that’s very big around renewable energy? Is it at the federal level, is it at the state level, or is it at the local level that we have the greatest opportunity to make progress? Debbie Dooley: Everybody will say and agree that Barack Obama, under his eight years of his administration, he was very much a pro clean energy president. Yet, I was fighting battle after battle after battle on the state level, because to me there are so many opportunities on the state level to advance renewables, to advance clean energy. Look what’s going on in North Carolina, South Carolina, a lot of the southern states, the states in the south, they are really going renewable. Under the Obama administration the real battle has always been on the state level. There is no change whatsoever under President Trump. The battle and the opportunities to advance clean energy, the best opportunity is going to be on the state level because especially Republicans, they pay attention to a lot of things that happen on the federal level but it seems like they’re much more interested on the state level or the local level because that impacts their daily lives much more than something on the federal level does. Christopher Mitchell: What do you see … I mentioned earlier this issue with the monopoly utility company, is that really the biggest barrier when we talk about people having a choice to go solar, or are there other things that represent a bigger barrier? Whether that’s the cost or something else. Debbie Dooley: I believe it is misinformation by Koch Brothers funded groups and the giant electric monopolies that prohibit competition and choice. For example, if we removed the regulatory barriers and allow solar and other clean energy to compete on a level playing field, and folks can generate their own electricity, they have the opportunity to enter into private contracts and sell excess energy to their neighbors. The cost portion will go away. I think a lot of people now in states where you have net metering, where they actually can sell the excess energy and you have all of that going on, I think you see rooftop solar flourishes. I think if we remove those regulatory barriers that exist and allow people to control the power they produce on their private property, you allow them to become entrepreneurs and actually make a profit off of it, then I think you’ll see solar and other clean energy to explode in the United States. Cost, yes, I see, hear a lot of people talking about the cost, upfront cost of rooftop solar, but if you remove those regulatory barriers and allow competition and choice, I think that’d do away with the cost concern. Christopher Mitchell: Debbie, you mentioned all this work at the state level, the unanimous support in Georgia I believe is what you were saying. I focus more on broadband issues. One of the things that’s odd is that we are often working with Conservative communities at the local level, we find at the state level it’s more often that Republicans are on the side of the cable companies and Democrats are mixed. At the federal level it’s almost totally partisan, where it’s mostly Republicans that are opposing the kinds of things we want to do for local power. I’m always curious when I’m talking to someone who’s more conservative, who do you look at in terms of leading lights on the conservative side for anti-monopoly thinking and anti-monopoly work? Debbie Dooley: There’s a lot of leaders on the conservative side that go after the monopoly. I think I’m the most vocal one that’s out there. Believe it or not, when you were talking about cable, you would not believe the comments and the complaints I receive from Republicans, from conservatives especially Tea Party Republicans, complaining about the local cable companies and how they would like to have a choice besides going to a satellite. I do believe that that is out there, that people do complain about that. I do see where you’re coming from, even in the electric monopoly model, a lot of Republicans are more aligned with these electric, government created electric monopolies, whereas a lot of folks on the Democrat, progressive side, aren’t as aligned. Again, that depends on situation but I can tell you, when I first began the work in Florida the Republicans were very closely aligned with the monopolies because the monopolies campaign contributions and all of that. I began to get the message out and began to work, work with a lot of the elected officials and influencing policy by giving interviews, and all of a sudden a lot of Republicans started saying, “Hey, maybe we need to take a closer look.” They passed legislation that remove the tangible property tax from commercial solar. They’re more open to renewables that they once were. I will be honest with you, I have seen some Democrats leaning groups that support monopolies too. It’s because these electric monopolies have a lot of money. They use their utility customers as cash cows, so it’s like they have these big money trees, so they have a lot of money that they can donate to a lot of both Democrat and Republican groups. Money drives a lot of this. I am changing it, look what happened in Georgia. Georgia Power was king forever, until, nobody ever defeated them, until 2013 when I formed Green Tea Coalition and partnered with Republicans on the public service commission to go against what Georgia Power wanted and got them to add more solar to their energy portfolio pix. I happen to believe that’s all changing. Christopher Mitchell: I want to agree with you before John asks the next question because that’s something that we definitely see. We certainly see progressive groups that people are surprised when they suddenly take a strong position in telecommunications in an issue they haven’t been involved at before. Then you find out that they got a bunch of money from a Comcast or someone like that. It seems like, I don’t want to give the impression that I’m suggesting it’s all on one side of the aisle, but I’m always curious in terms of very briefly if there’s any authors or media personalities you think get this right at the national level? Debbie Dooley: I don’t know a whole lot of folks that are willing to do that. Now, I am sure there are some out there but I would look on the libertarian progressive side, I would look in Nevada. We had a big battle in Nevada against the monopolies there and the libertarian party was very much involved in that. They created a group called Unplug Monopolies. I would look at a John Stossel on Fox Business Network or someone like that. For example, Republican celebrity actor Arnold Schwarzenegger is not fond of monopolies either. John Farrell: Debbie, this is John. I was interested in asking you about one policy you thought that would really make a difference. You alluded earlier to net metering being something that really helps drive that opportunity for individuals to go solar and get fair compensation but given this discussion about monopolies, it’s certainly an issue that we faced here in Minnesota as well. A utility company was supposed to get regulatory approval of a power plant and they went to the legislature and got approval to skip all of the cost analysis. I’m curious, is the end result, is the policy that we really want if we could have a magic wand that would get rid of the monopoly, that would make electricity service more competitive, not just from the economic side of things but also breaking apart the political power of these utility companies. Debbie Dooley: I think that would absolutely do that. I would encourage everyone to actually look at what Texas has done in regard to their electric utilities. They did not call it deregulation because a lot of is still a little bit regulated. They call it a restructuring. People like individual liberty, especially Republicans, Democrats, that’s something that’s bipartisan. Being able to actually be self-sufficient so you’re not reliant on a centralized authority and you can generate your own power and you can pay for the cost of it by actually selling excess power to your neighbors, then that would be something that I really and truly believe would take off. Look what’s going on in Texas, wind power is very big in Texas. I think that’s something that we really need to look at. Another thing that people are increasingly concerned about, there is nothing more prone to a terrorist attack than our centralized power grid. The federal energy regulatory commission found a few years ago that terrorists would have to take down nine of the key substations and it would cause a blackout from coast to coast that would last weeks. If we move to a rooftop solar kind of decentralized power structure, that would help protect us against such a devastating impact of our centralized power grid going down. 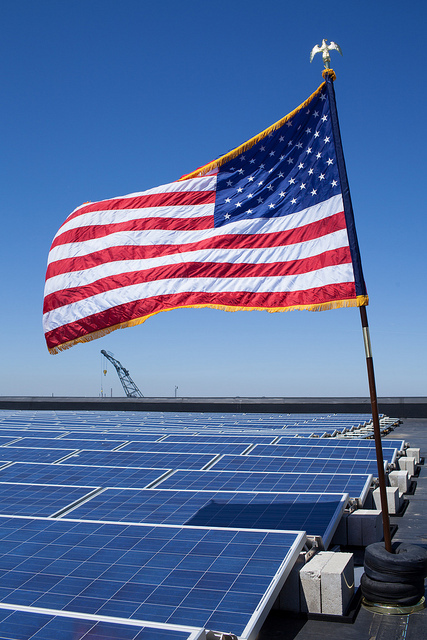 I fully believe that solar is a national security issue. Christopher Mitchell: Debbie, where do you see the opportunities for bipartisan action given your success in Georgia and other places? I’m curious too if Donald Trump’s election has changed the nature of the work, trying to work across party lines. Debbie Dooley: I say there’s a lot of opportunity. These battles in Florida, we have a bipartisan coalition in Florida. We work together to try to advance solar based on free market competition and choice. We work with, in Florida, one of the partners on the left that I’m very close to and work with is Southern Alliance for Clean Energy, Dr. Stephen Smith. He gets it. He understands that the message has to be different when you’re trying to reach Republicans than when you’re trying to reach progressives. We’ve been working together I believe it’s since really 2014 and we have a great working relationship together. We hang together in Florida, the monopolies put a referendum on the Florida ballot that would increase their power and would have really hurt solar. It would have given them even more power to kill solar. It was masquerading as a pro-solar ballot. Left and right came together, election night I was in the Tampa area, we all flew down to see if we were able to defeat it. On election night Democrats and Republicans, conservatives and progressives came together to actually watch the local election returns in Florida to see if we were able to defeat the referendum that these electric monopolies had spent over $20 million on to pass. We were able to defeat that. We celebrated, we had Champagne. Then through parts of the night all of the Democrats were basically on one side of the room, in one section, watching the presidential election returns, and the Republicans in the coalition were on the other side, seeing if Donald Trump would win. We respected each other’s difference. We would joke with each other. In Georgia the coalition has been bipartisan. In Nevada, it’s been a bipartisan coalition. The key to that is being able to come together and respect each other’s differences. We don’t talk about issues we don’t agree on, that’s a taboo subject. That’s the key because fighting for renewables and fighting these electric monopolies and fossil fuel interests, it’s a David versus Goliath battle, so we’re much more successful and it’s been my experience where we find a way to work together on issues we agree on. As far as Donald Trump’s election, it has really not changed my work one bit with the exception that I get a lot of news interviews because they know I’m a Trump supporter. Christopher Mitchell: You mentioned one thing I want to follow up on very briefly. That’s, you agree with people that you have different political views from to not discuss the issues that you disagree on. Is that just when you’re in the meeting talking about the issues? Do you ever go out for drinks afterward and then you can have debates and let your hair down? Or is it really that you try to avoid talking about these issues at all? Debbie Dooley: We avoid talking about the issues but we do socialize. Here in Georgia a friend, Colleen Kiernan used to be executive director of Sierra Club, we would meet for lunch or have drinks. I would always go to see her club’s Christmas party and all that, but we did not talk about, we avoided topics that we disagreed on because we knew that was counterproductive and we would not change each other’s mind. Now in Florida, some of the people that I’ve worked with on the front lines and stuff like that, fighting these battles in Florida, we’ll joke, they’ll laugh and call me a tree hugger because that’s what a lot of the Koch funded groups used to call me when I first became a very strong advocate for solar. But it’s best to avoid the topic because it will be divisive and it’s better to focus your energy on issues you agree on or talk about movies or personal things, but stay away from the topic of politics. Christopher Mitchell: Right. I think it’s worth noting. We’re told by national media that we’re such a polarized society but it’s worth remembering that there are a lot of people that manage human relationships without having arguments that are political and divisive. I wanted to highlight that. Can I ask you as a final question, do you have any recommended books or articles that anyone that’s been enjoying our conversation should read? Debbie Dooley: I’ve written articles for the UK Guardian that talks about my solar belief. I’ve written those, they’re actually articles. There’s a video. I’ve done two videos with Vox, vox.com. One of the videos actually talks about the Republican talking points. About two months ago I spoke at UC Berkeley on an energy panel. We got along great. They asked me why I supported Trump, I laid out the case, respectful and they said, “We disagree with you but you have the right to believe the way you believe.” I could not have been treated better at UC Berkeley. It was phenomenal. I loved being there. April 1st I spoke at Columbia University in New York City. Same thing, treated very, very well. You have treat … When you’re working with your friends, with friends on the left, progressives, you can be friends. I went to University of Alabama and I live right in the middle of Georgia Bulldog country during college football season, but that doesn’t mean people that don’t like Alabama are my enemies. They’re not, they’re friends. Christopher Mitchell: Maybe for a few hours. Debbie Dooley: For a few hours, right. I would like to say, you have to treat politics like you would when you’re having a big family thanksgiving dinner, you don’t approach the subject that you know will cause controversy. I would recommend a book that can be very useful, it’s called America, The Owner’s Manual and how to beat city hall. I’m mentioned in the first part of it. It was written by former Democratic governor and senator from Florida, Bob Graham. He’s a great guy. That’s something that’s really instructive that will tell you how you can put your differences and work with people across the aisle. Like, it’s okay to bring up issues besides, “Hey, how do you feel about this issue and about that issue.” When we do we find that the left or right have a lot more in common than just energy. For example, the Trans-Pacific Partnership agreement, I worked with my friends in the labor union to oppose that. You have teachers unions are working with, in many states working with conservatives to stop common core. A lot of this has already been done in Georgia. I’ve worked with groups on the left, formed a coalition to stop a anti-union bill that was backed by the chamber of commerce. I worked with a lot of the same groups to oppose tax payer funding of a sport stadium. There’s a lot of opportunity that’s out there, you just really have to be respectful and really don’t discuss issues you don’t agree on and you’ll be much more successful. Christopher Mitchell: Thank you so much for your time and all of the work you spent and all these years organizing for local power. Debbie Dooley: Thank you. It’s an honor that you asked me to be on your podcast. You guys are great. John Farrell: Thanks so much Debbie, great talking to you. 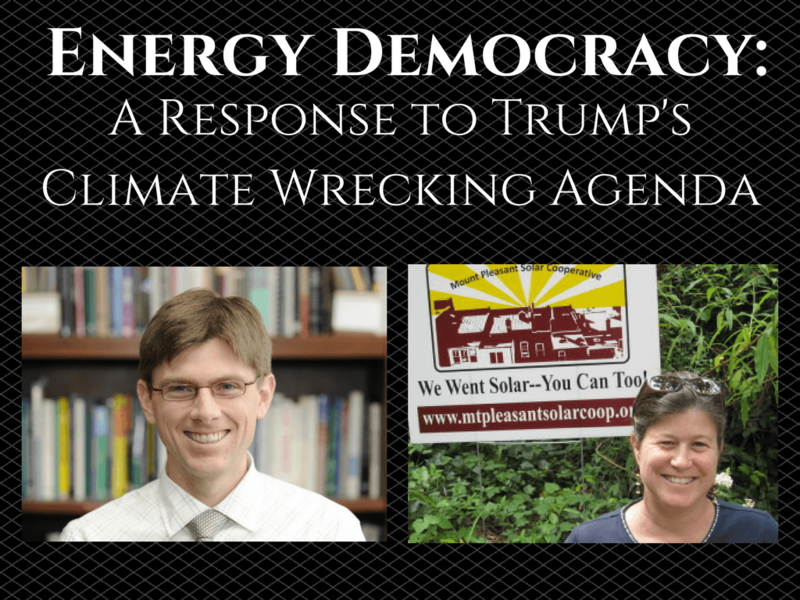 Lisa Gonzalez: That was Debbie Dooley, president of Conservatives for Energy Freedom and the Green Tea Coalition, joining John Farrell from our Energy Democracy initiative and Christopher Mitchell from the Community Broadband Networks initiative. This was episode 24 of the Building Local Power Podcast. Learn more about Debbie’s organization at energyfreedomusa.org. Also, both organizations have a presence on Facebook. Subscribe to this podcast and our other podcast, Local Energy Rules and Community Broadband Bits, on Apple Podcast, Stitcher or wherever else you get your podcasts. You can also sign up for our monthly newsletter at ilsr.org. Thanks to Dysfunction Al for the music licensed through Creative Commons, the song is Funk Interlude. I’m Lisa Gonzalez for the Institute for Local Self-Reliance. Thanks again for listening to episode 24 of the Building Local Power Podcast.